You will find the most up-to-date needlepoint supplies, finest hand painted needlepoint canvases, as well as the most interesting people. You never know what will inspire you when you walk through the doors of The Needle Bug. This jewel of a needlepoint store carries more than 1,500 canvases, over 120 lines of threads, an impressive array of beads, buttons, and sequins all to make your project a work of art as well as a treasure! 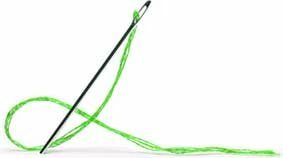 Now, if you are a true needlepointer then you know that it is not only the canvases, threads, and baubles that you need. A true needlepointer needs ALL the accessories too! So, we pride ourselves in being-up-to date on all the accessories needed such as frames, stands, lamps, magnifiers, totes, magnets, and laying tools. If you are looking for something special and we do not have it, just ask and ‘I can order you one’. As you know, we are located in the capital of Alabama, Montgomery where there are always fun things to do while you are here shopping at The Needle Bug. We have the Montgomery Biscuits Baseball team, the Dragon Boat Races, and Alabama Shakespeare Festival Theatre. But most of all, we have the best needlepoint store in the South. If you are looking for classes look no further! We host national teachers such as Carole Lake, Julia Snyder, Michael Boren,Tony Minieri, Robin King and many more to share their knowledge and enthusiasm for stitches. Along with national teachers, we have local teachers that will be happy to teach you from start to finish inspiring you as well. With our roots firmly planted in Montgomery, our connection to the community is very important to The Needle Bug. We are passionate about supporting our local causes. In 2013 we hosted the first fundraiser for One Place Family Justice Center, an umbrella facility for victims of abuse and their children. The Needle Bug had more than 200 stitchers attend, as well as patrons of the arts, raising over $2,500 for the organization. The Needle Bug designed needlepoint kits to benefit Children’s Harbor, a retreat on nearby Lake Martin benefiting children with serious illnesses. Our stitchers have the opportunity to purchase the kits, stitch them and then donate them to patients at the Birmingham Children’s Hospital affiliated with Children's Harbor. Let’s not forget our furry 4-legged friends! Annually, The Needle Bug collects food for dogs and cats, along with supplies for area Humane Shelters. The food is traditionally collected to celebrate Leigh's Birthday! When food is collected, on a special date, the customer receives a discount on an item equal to the percentage donated...up to 50lbs. In addition to the food drives, The Needle Bug hosts a Towel Drive for the shelters, too! Here each towel that a customer brings to donate enables them to put their name in a drawing for a $200 Needle Bug Gift Certificate. Owner Leigh Walker Miller has always loved color. As a child she had a tin box where she kept her crayons, so she could carry them with her wherever she went. Leigh’s box has remained with her to this day, a touching reminder of her fondness for color. When you visit The Needle Bug, you’ll see Leigh’s passion for color first hand, in the beautiful collection of threads and accessories she has collected for you, and in the warm and caring environment she has created for her clients. Leigh also understands the value of fellowship and friendship that needlepoint can bring. 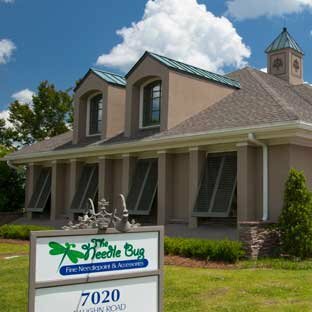 As a result, The Needle Bug fosters a friendly, relaxing family atmosphere that fully engages our clients and guests. The atmosphere of fellowship has served to both heal and celebrate many life events. Leigh has seen her customers through cancer, deaths of spouses and parents, and many other life crises, as well as through joyous occasions such as weddings, graduations and the births of many children and grandchildren. This unique place is a stitching refuge and is loved by all who frequent it! To experience the best of what The Needle Bug has to offer, join us on Wednesdays from 10:00 until “whenever” for the open stitch. Customers bring their current projects and enjoy fellowship while stitching together in a fun and relaxed atmosphere. The Needle Bug has much to offer any stitcher, no matter the level, interests, or time availability. Please feel free to visit us any time. We love adding friends to our needlepoint family!